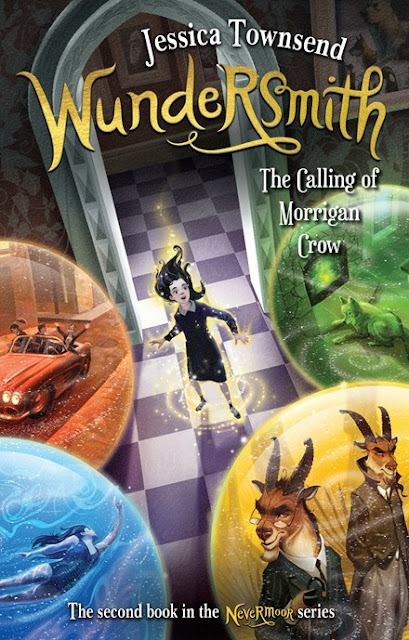 Wundersmith, the second book in the brilliant Nevermoor series sees Morrigan Crow escape her curse, pass all her Trials and enter the Wundrous Society. After being unwanted by her own family, Morrigan has found the family she’s dreamed of at the Hotel Deucalion with all the staff that run it. But discovering she is a Wundersmith is not all she’d imagined. Magic can be used for good and bad deeds. It is a power that can be manipulated, and Ezra Squall, the only other living Wundersmith, is determined to win her over and into his devious world. He knows how to use the magical Wunder to serve his evil cause, and Morrigan’s added ability will make him even more powerful. Nevermoor is full of secrets, and just when Morrigan thinks she has a hold on life there, new challenges and surprises surface. People she thought were bad, show goodness. New friendships are formed. Her best friend Hawthorne Swift, the Dragonrider, remains her guiding light, as her patron Jupiter North is away most of the time now on secret business. Disappearances, blackmail and serious bullying throw the finally harmonious Wundrous members of Unit 919 into panic and disarray. Can Morrigan fight Ezra Squall’s power? She has discovered she can breathe fire when she’s angry. Will this prove to be more damaging than beneficial? Jessica Townsend has created an extraordinary world where riveting characters live mystical lives, display special abilities and realize their dreams via their intelligence, problem-solving, strength of mind, time travel and portals. It is the many themes that run through the novel that energize the book. Identity, friendship, love, family and finding a place to belong seep through the pages. Townsend has introduced many imaginative issues within a powerful storyline full of plots, and twists and turns where nothing is predictable. Meanwhile, the war between good and evil continues to rage. Each book will be read in one sitting, regardless of the almost five hundred pages it boasts. There’s no way readers will put this down before it is finished.